2.Remove the tofu and set aside, leaving the remaining oil in the wok. Stir the ginger and curry paste into the hot oil for a few seconds until the curry paste is fragrant and the ginger begins to turn golden. Add the zucchini and bell pepper; cook and stir for 1 minute. Pour in the lime juice, soy sauce, maple syrup, coconut milk, and tofu. 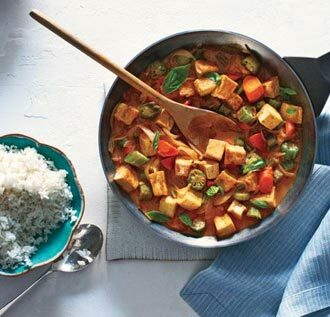 Bring the coconut milk to a simmer, and cook a few minutes until the vegetables are tender and the tofu is hot. Stir in the chopped basil just before serving.